Could genetic code determine someone’s Starbucks habit? Apparently so, according to a new study by researchers at the Harvard T.H. Chan School of Public Health (HSPH). Their data suggest that people instinctively regulate their coffee intake in order to experience the optimal effects of caffeine. Produced with the support of the Coffee and Caffeine Genetics Consortium and published in the journal Molecular Psychiatry this past fall, the study—one of several recent HSPH investigations of the popular beverage—involved a meta-analysis of genomic data from more than 120,000 regular coffee drinkers of European and African ancestry. 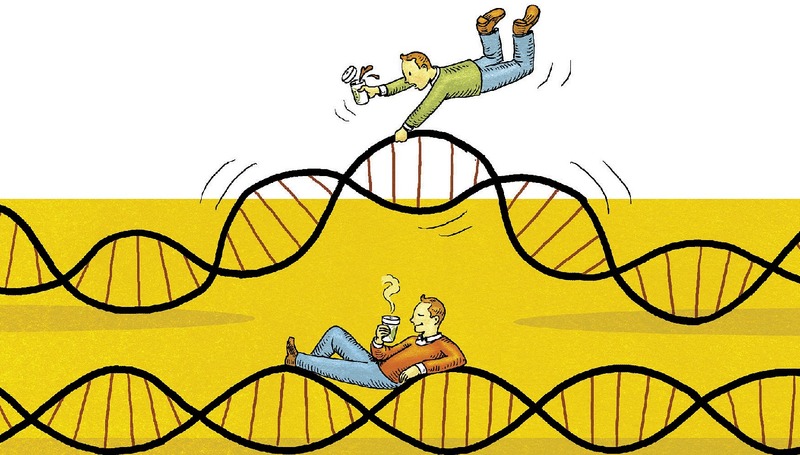 The researchers analyzed their subjects’ genetic makeup through DNA sequencing, and compared those results to self-reported coffee-drinking figures, in an effort to understand why some people need more of the stimulant than others to feel the same effect. Lead author Marilyn Cornelis, a former research associate in the HSPH nutrition department who is now assistant professor in preventive medicine at Northwestern, says their findings provide insight not only on why caffeine affects people differently, but also on how these effects influence coffee-drinking behavior. One individual, for example, may need three cups of coffee to feel invigorated, while another may need only one. If that one-cup-a-day person consumes four cups instead, Cornelis explains, any jitters or other ill effects that result may discourage that level of consumption in the future. Her team identified six new genetic variants associated with habitual coffee drinking, including two—POR and ABCG2—related to caffeine metabolism, and another two that may influence the psychological boost and possible physical health benefits of caffeine. The most surprising aspect of the study, Cornelis reports, was the discovery that two genes involved in glucose and lipid metabolism—GCKR and MLXIPL—are also linked for the first time to the metabolic and neurological effects of caffeine. A third recent HSPH-affiliated study that tracked 50,000 women for 10 years found that those who drank four or more cups of caffeinated coffee per day were 20 percent less likely to develop depression than nondrinkers. The researchers speculate that long-term coffee drinking may boost the production of “feel good” hormones such as dopamine.